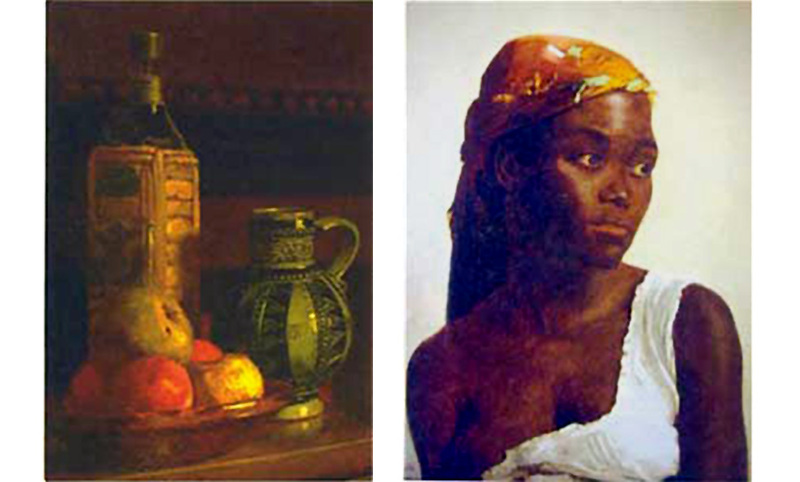 Two paintings by May Alcott Nieriker (1840–1879): Still Life with Bottle, oil on canvas, was exhibited in Paris Salon of 1877 and is described in Louisa May Alcott’s “My Girls.” La Negresse, oil on canvas, was exhibited at the Paris Salon of 1879. The boys and girls will be delighted,—we can vouch for two enthusiastic ones already,—with the announcement that Messrs. Roberts Brothers, Boston, have in press, and are to issue on the first of next month, a new volume by Miss Alcott, under the taking title of “Aunt Jo’s Scrap Book,” and containing twelve stories, the opening one being called “My Boys.” . . . The book, Aunt Jo’s Scrap-Bag, with the subtitle, My Boys, Etc., was a huge success, and readers (and not a few critics) begged for more. “Dear Aunt Jo!” cried a reviewer in the Providence Press, “Your scrap-bag is rich in its stores of good things. Pray do not close and put it away quite yet.” And so, over the next decade, five additional Scrap-Bag volumes appeared. Yet, if Alcott herself is to be believed, after the publication of the first volume, some readers complained: What about the girls she had known? Thus, the fourth volume of Aunt Jo’s Scrap-Bag, which appeared in 1878, carried the subtitle My Girls, Etc. Echoing her earlier sketch, the opening selection describes six young women in her circle of friends, those who have pursued careers instead of, or in addition to, the traditional roles of wife and mother. She doesn’t refer to any of the women by name, yet there are enough clues to identify the inspirations for two of them. The doctor called “A” has been alternately identified by scholars as one of two women (or a composite portrait of both): her close friend Laura Whiting Hosmer, a homeopathic physician in Concord, or Lucy Sewall, Alcott’s second cousin and financial advisor and a resident physician of the New England Hospital for Women and Children who became its director in 1869. There’s no doubt, however, concerning the identity of the painter Alcott calls “B,” who is her sister May. As described in the selection, May departed for Europe, first to produce reproductions of paintings by English artist J. M. W. Turner and eventually to create original works. In 1877 she submitted an entry in the famous biennial Salon of Paris and wrote to her mother that, if her painting were accepted for display, “it will be a very great honor, and a fine feather in my cap to start a career with, for color-dealers, picture-purchasers, and all nationalities, turn to the Salon catalogue as the criterion by which to judge of an artist whose name is unknown to them.” Her painting, a still life (shown above), was selected for the exhibit, and her proud sister Louisa wrote “My Girls” a few months later. The following year May married Swiss businessman Ernest Nieriker. “I mean to combine painting and family, and show that it is a possibility if let alone,” she insisted in one of her letters home. “In America this cannot be done, but foreign life is so simple and free. . . . I often wonder if I could step back into my old life and feel at home there, for I seem quite a different person from the woman who bade you good-bye so long ago.” A second painting, La Negresse, was accepted for the Salon in 1879 and she even published a book for would-be artists, Studying Art Abroad, and How to Do it Cheaply. Unfortunately, May Alcott Nieriker died in December of that year, only weeks after giving birth to a daughter, christened Louise Marie in honor of her aunt. The infant was sent to Boston and raised by Alcott until her death in 1889, when “Lulu” (as her Boston relatives called her) was returned to her father and spent the rest of her ninety-six years in Switzerland. Notes: On page 851, Alcott refers to several J.M.W. Turner paintings her sister sold as reproductions. You can view the originals at the following links: Venice, seen from the Giudecca Canal, The Sun of Venice Going to Sea, The Fighting Temeraire, Admiral Van Tromp’s Barge at the Entrance of the Texel, and Datur Hora Quieti. Pillicoddy, mentioned on page 854, is a character in the nautical comedy Poor Pillicoddy: A Farce in One Act (1843). The Infant Phenomenon (p. 855) is Ninetta Crummles, a member of the theatrical troupe in Dickens’s Nicholas Nickleby. Bijou Heron (page 857), was a famous child-actress who starred in the comedy The Little Treasure (1855). Topsy (p. 588) is a slave girl in Harriet Beecher Stowe’s Uncle Tom’s Cabin whose famous response to the catechistical question “Who made you?”—“I spect I grow’d. Don’t think nobody never made me.”—inspired the popular figure of speech “it grow’d like Topsy,” used to suggest development without the benefit of guidance or direction. 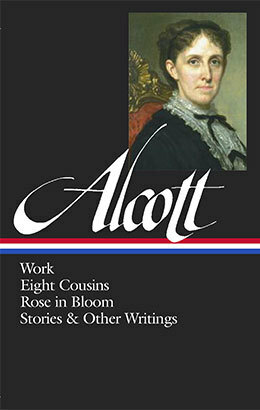 On the last page, Alcott lists several contemporaries as models for young women: woman suffrage and temperance reformer Mary Livermore, who edited The Agitator and Woman’s Journal, for which Alcott wrote; Ednah Cheney, a writer, suffragist, abolitionist, and lecturer at Bronson Alcott’s Concord School of Philosophy, who later wrote two biographies of Alcott; Julia Ward Howe, author and activist for suffrage, prison reform, and international peace, best known for writing “The Battle Hymn of the Republic”; Maria Mitchell, an astronomer and professor at Vassar College and the first woman elected to the American Academy of Arts and Sciences; and Lucy Stone, the first woman from Massachusetts to earn a college degree, a leader of the women’s rights movement, and founding coeditor (with her husband) of the Woman’s Journal. Once upon a time I wrote a little account of some of the agreeable boys I had known, whereupon the damsels reproached me with partiality, and begged me to write about them. . . . If you don't see the full selection below, click here (PDF) or click here (Google Docs) to read it—free!